As you are likely aware, Tissot is the official timekeeper for NBA. I mean, you can’t let Omega take all of the timing glory for the Swatch group, right? To date, they’ve released watches specifically in reference to a single team. So, if they had one for your favorite team, you were in luck. Everyone else? Tough luck. Well, until now. For all those superfans, or folks who just really like the NBA in general, we’ve got the Tissot Chrono XL NBA Collector Special Edition. At first glance, you might not see a whole lot that makes the Tissot Chrono XL NBA Collector Special Edition anything that is NBA oriented. The first clue you have is the strap. No, that’s not ostrich – that’s basketball leather there. On top, it looks like it was cut out of your favorite Spalding; on the reverse, you’ve got a sueded surface that makes for a comfortable fit on the wrist. However, much like other watches I’ve reviewed with not-great straps, this one has that vaguely chemical smell to it. Definitely not a rich leather scent (then again, most basketballs don’t either), and it does have a bit of a squeak in the lugs. That aside, it is definitely a slice of b-ball on your wrist. Moving on to the watch itself, there’s nothing on the dial side that denotes it as being an NBA special edition. No logos, not even a little bit of verbiage. It’s just a simple three-register chronograph (chrono minutes and hours on the top, running seconds down below), with a rather flat printed dial, white on black. You do get a bit of the basketball orange showing up on the chronograph hands, but otherwise, that’s it for color. Set as it is into a black case as well, you’ve got a pretty vanilla quartz chronograph here. Sure, it’s got the Tissot name on it and an ETA G10.212 movement inside, but it feels lacking. Now, I will admit that chronographs are not my first choice. 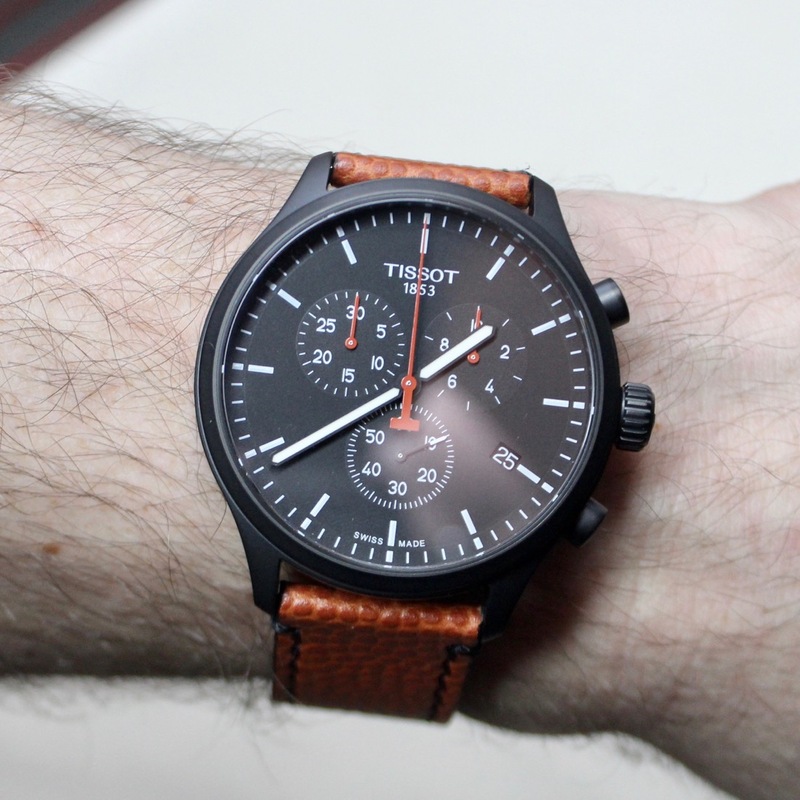 Even so, if it weren’t for the Tissot logo and T seconds hand, this could be any other non-descript, generic chronograph. Then again, perhaps it was kept that way to allow you to focus on the caseback. You see, the caseback of the Tissot Chrono XL NBA Collector Special Edition is where the specialness of the special edition comes in to play. Here, we first see the NBA logo on the watch. Don’t want to display just a boring-old league logo? Well, friend, then you can swap out that glass insert for a team of your liking, any of the thirty teams. Yes, that’s right – you’ve got inserts for ALL of the NBA teams. Overkill? The answer is probably yes – but then again, I’m probably not the target audience for this watch. To change out the caseback, you need to delve back into the display box the watch comes in. To be fair, that is the first, very obvious, way the watch ties to the NBA. It looks like a shiny court floor, complete with a basketball sunk into it. That ball is actually the caseback tool. It has three tabs in it that match up to notches on the caseback bezel, and allows you to unscrew it. Once that ring is out, you swap out the glass logo for whatever one you want, and then you tighten things back up. Just take your time. You definitely do not want to cross-thread this one. You’ll also need to fiddle with it to get things kept straight. When I tried it out, that last tightening turn invariably twisted the insert a bit. There is a sticky bit under there to try to hold it still, but it’s apparently not strong enough. Perhaps a small bit of double-sided tape is what’s needed here. Once your team affiliation is set, you strap the Tissot Chrono XL NBA Collector Special Edition on and go about your way. The basketball strap is a tad stiff, but it fits the wrist well enough, and will no doubt conform to your wrist. But that logo you’ve chosen? Well, it’s nowhere to be seen. Because it’s, you know, against your wrist. And that’s just one aspect of the watch that I don’t get. Sure, you’ve got the lovely case that stores all of the team logos. But who is this meant for? Who likes ALL the teams that much to want all of these? Is there some “gotta catch them all” thing going on here? I don’t know. And then, once the watch is on, your team support is nowhere to be seen. Perhaps a good thing for someone like me (a Pistons fan in Bulls territory), but it seems if you’re willing to pay for team paraphernalia, you want to show it off. The idea of a changeable caseback is interesting, in practice, and the very plain watch keeps the focus on the colorful logo. At least, when you can see it. Would I wear it?That’s a solid No for me. The best thing about it:The swappable caseback inserts – that’s the only thing of interest here.